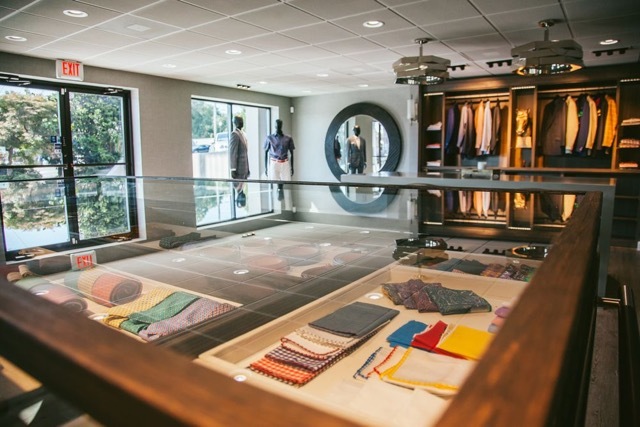 The art of bespoke tailoring isn’t lost on Atlanta. 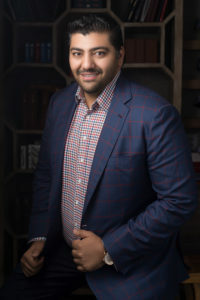 Neil Balani, the owner and chief tailor of HKT Custom Clothiers, has created highly customized suiting for Atlantans since 2005, and the family-run business has offered bespoke tailoring since 1970. In fact, if you’re looking for a Savile Row-style tailoring establishment, you will feel very comfortable in the capable hands of Neil, who both understands the logistics of running a bespoke clothing brand, as well as the intricacies of how to tailor. Neil, How did you get into tailoring? Back home in Malta, my dad was in the men’s clothing and tailoring business, so I saw it on the daily when I was visiting him at the shop. HKT is a bit different because we’re into making custom suits, versus just alterations. But, tailoring has always been in my life. 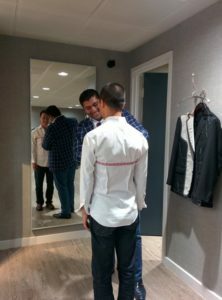 Explain the process of creating a bespoke suit for a client. First is understanding the client’s needs to get an idea of what fabric is needed and their lifestyle. We help them choose fabrics; we carry over 3,000 different types, which are all different depending on the use such as work travel or a wedding. We then go through the details of the garment, including the styling of the suit – so one or two button, pleats or no pleats, double-breasted or not. Then we take body measurements to create a pattern, which we keep on file. In four to six weeks the garment will be complete for him to try where we will do a couple of light fittings to make additional adjustments. Then it will be completed in a week. What elements are crucial to creating the perfectly tailored suit? The key is to understand what a client wants, but at the same time give them the advice on how a suit should fit. It’s not as easy as just taking body measurements, but consulting them on how we can design the suit to fit for their body. Beyond suits, HKT Custom Clothiers offer custom shirts, belts, jeans, sports jackets, trousers, tuxedos, sweaters, polos, as well as a whole line of luxury men’s accessories like ties pocket, squares, cufflinks, and sunglasses. 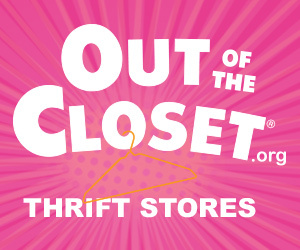 What’s your favorite item of clothing – and why? I love my bold sports jackets and a nice pocket square to give it that finesse. I like to make a statement, but at the same time I tone it down with nice jeans or dark colored pants to keep it in balance. How do you keep up with trends and get inspiration for your work? I go through our archives and take inspiration from what we created over the years. Since we’ve been in business so long, we can look back and see what we were creating in the 70s and 80s to take inspiration. I also watch what’s happening with British and Italian fashion trends, pulling from the best trends to create our own here in Atlanta. 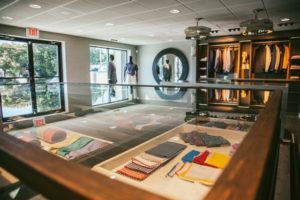 As a bit of Savile Row flair in Atlanta – how do you view the style of Atlanta’s men? Style in Atlanta has really improved from even five years ago. I’m now seeing that even the youngest generation is dressing up much more instead of wearing shorts and tees to the office. The music and film industry has also had an influence in making people dress up more. The younger man wants to stand out as a person, and from a style and business perspective, it’s upped the game. Atlanta has its own look that’s in the middle of LA and NYC, so a mix of casual street style with curated dressed up and well-designed pieces. What is it about bespoke suiting that makes it so unique? Bespoke suiting is an art and a craft that is very unique in itself. It’s all about perfection and making something that is precisely for the individual, not an off the peg suit that has to be altered to try and fit them. At HKT it is a personal service as well; we get to build a relationship with our clients, and that helps us set a different standard. You really have to get to understand someone as a person to craft something so personal for them. Bespoke suits are also something you’ll wear for a lifetime. We’ve had clients come to us with suits from 1986 that we made. They still fit and look great, but we’re able to update them, so they reflect today’s styles. 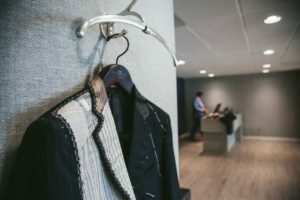 Your return on investment with a custom suit is actually better than an off the peg suit since it will last you longer and you’ll get more wears. Why should every man experience having a custom clothing item made? Everyone should experience knowing that a clothing item is made just for them, solidly for their body. It’s not going to fit anyone else. I think the custom clothing experience is extraordinary and amazing from start to finish. 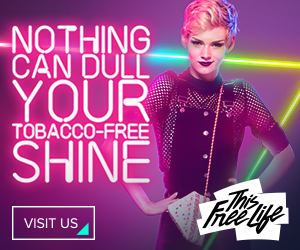 There is nothing better than having something that fits for your confidence. That is where guys have trouble buying off the rack clothing because the items don’t fit great and they are uncomfortable. With alterations, you can only do so much. What do you think is the biggest misconception about bespoke clothing? People tend to think bespoke clothing is just way too expensive, but realistically it’s not. They think it’s something beyond their conception or are even unaware of it. But it’s really something to try in life. Once you enjoy the process, you’ll find it amazing. Arrange for a personal style consultation with Neil. Call the store to arrange an appointment at 770-458-8662 or go online at hktclothiers.com/appointments. You can also learn more about HKT Custom Clothiers and get the latest styles by following their Instagram at @hktclothiers.